As research progresses and information continues to proliferate in the field of molecular design for therapeutic use, there is a need for a reference that brings current theory and proven practice together in a how-to volume. This reference guides scientists new to the field on how to design small molecules that interact with critical protein targets. The chapters condense useful material into a manageable format which is carefully organized and presented. It offers an essential resource for a variety of chemists in academia, and the biotech and pharmaceutical industries, as well as professionals in complementary fields. Karen E. Lackey is the Vice President of Chemistry in Molecular Discovery Research at GlaxoSmithKline. She is responsible for exploratory chemistry and new technology early stage research. Prior to her current assignment, Lackey served as International Director of Systems Chemistry in Discovery Research for GlaxoSmithKline, responsible for generating multiple chemical series for over ten therapeutic areas of drug discovery. 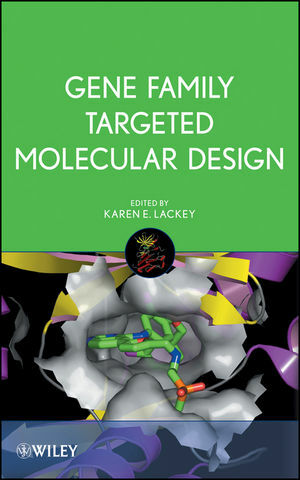 Chapter 1: Drug Discovery by Gene Family (Karen Lackey). 1.1 General drug discovery components. 1.2 Further reading for expert knowledge. Chapter 2: G-Protein Coupled Receptors (Stephen Garland and Tom Heightman). 2.2 GPCR Structure and Function. 2.3 Challenges Facing the Area of GPCR Drug Discovery. Chapter 3: Ion Channels Gene Family: Strategies for Discovering Ion Channel Drugs (Maria L Garcia and Gregory J. Kaczorowski). 3.2 Ion Channel Sub-Family Descriptions. 3.3 Structure of Potassium Channels. 3.4 Criteria for Selection of Targets and Establishing Screens. 3.5 A Case Study in Ion Channel Drug Discovery. 3.6 Perspective on Ion Channels as Drug Targets. Chapter 4: Integrins (David D. Miller). 4.4 Challenges - Past and Future. Chapter 5: Strategies for Discovering Kinase Drugs (Jerry Adams, Paul Bamborough, David Drewry and Lisa Shewchuk). 5.2 Protein Kinase Structural Features. 5.3 Generating and Optimizing Kinase Inhibition. 5.4 Establishing Screens for Understanding Kinase Activity and Selectivity. 5.5 Case Studies of Successful Kinase Drug Discovery. Chapter 6: Protease-Directed Drug Discovery (Richard Sedrani, Ulrich Hommel and J"rg Eder). 6.6 Perspective on Proteases as Drug Targets. Chapter 7: Small Molecule Inhibitors of Protein-Protein Interactions: Challenges and Prospects (Adrian Whitty). 7.2 Structure and Properties of PPI. 7.3 Structural and Physicochemical Challenges to Inhibiting PPI with Small Molecules. 7.4 Identifying Hits and Leads Against PPI Targets. 7.5 Assessing the Druggability of New PPI Targets. Chapter 8: Transporters (Anne Hersey, Frank E. Blaney and Sandeep Modi). 8.2 Methodologies in Transporter Drug Design. 8.3 Therapeutic Transporter Targets in Drug Discovery. 8.4 Transporters as Liability Targets. 8.5 Applications of Methods for Designing Out Interactions with Liability Targets. Chapter 9: Nuclear Receptor Drug Discovery (Hiroyuki Kagechika and Aya Tanatani). 9.2 Nuclear Receptor Super Family and Their Functions. 9.3 Agonism and Antagonism in Nuclear Receptor Functions. 9.4 Medicinal Chemistry of Retinoid Nuclear Receptors. 9.5 Clinical Application of Retinoids. Chapter 10: Summary and Comparison of Molecules Designed to Modulate Druggable Targets in the Major Gene Families (Karen Lackey). 10.2 Summary of unique features for each target class. Brief biographies of contributing authors.